The shop is not the safest environment for your hands: power tools, sharp edges, muscle flexing, corrosive liquids, grinding gears, and electric shocks just to name a few hazards. Occupational safety must never be overlooked, it does not matter if you are a professional grease monkey or a Sunday DIY-mechanic, taking care of your precious digits should always be a top priority in any garage. In order to help you navigate the overwhelmed and confusing market of mechanic gloves, we have created this amazing and simple to read buying guide, with the top ten products out there right now from all sorts of classes and tiers, so you can make the best-informed decision for your hands and the hands of your workers. Our top choice for the list comes from the celebrated California manufacturer, which designs and crafts incredible protective wear for all kinds of occupations. The gloves are the top of the top when it comes to hands protection, with a set of features and proven quality of build that has given them a major share of the market in the military, federal and local security agencies, maintenance, and of course, mechanic industries. Originally designed for the military, it was not too long before other professionals with protective wear needs realized that these gloves are the best of best out there, and so everyone wanted one pair. This product provides an unmatched fit, feel and functionality that will let you focus on the task at hand knowing that your palms and fingers are cared for. 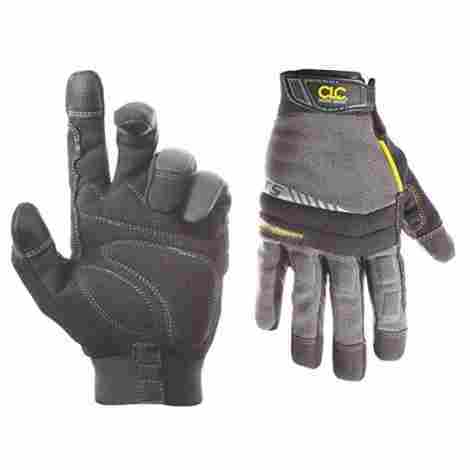 The Coyote’s form-fitting Trek-Dry® will keep your hands cool and comfortable whilst performing any hard task. Its reinforced thumb and index give it extra strength and longer life. But that is not all, since its synthetic leather in touchscreen-capable for the perfect balance between durability and dexterity. It is not possible to put a price on your protection, and this top-shelf product would cost you less and last you longer than a couple of beers and dinner at the pub. So according to our criteria, this product constitutes an amazing cost/value ratio and we are sure that anyone who buys it will get satisfaction whilst giving their hands the best care. Second place in our buying guide we feature a great deal on all-purpose work gloves. Sold in a six-pairs pack, they are a must-have in any garage or garden, so you can perform all your projects and tasks without neglecting your hand care. These nylon-knitted gloves will form and fit any shape and size of hands, and thanks to its seamless construction you get the maximum flexibility and dexterity for your fingers. Its breathable characteristics allow your hands to stay cool and after a few minutes of wearing them, odds are you will forget about them. The nylon in palm and fingers of these mitts is also covered with a breathable nitrile coating, resisting liquids and providing extra protection against cuts, punctures, and abrasions, keeping all undesirable residues from going into annoying places such as under your fingernails. We loved this product, not only for performing great in both professional and household environments and being machine-washable but also for its incredible price for a bundle deal. 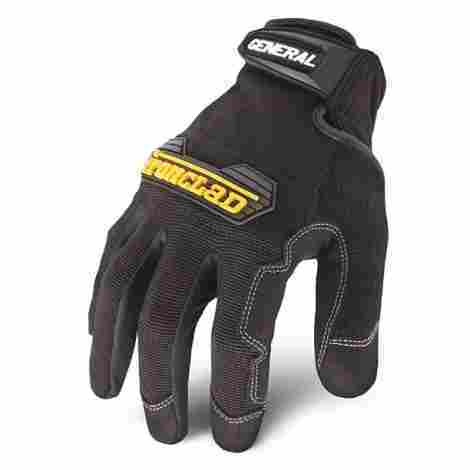 So if you are looking to stock your garage or shed with safety and quality gear, the G & F 1519 Work Gloves are the right choice for you. Moving on to number three in our list, we present you with one of our favorite finds whilst doing the research for this guide. Its cold weather insulation allows you to perform outdoor task year-round saving your hands from that awful winter chill, and all the features packed into this product will make you instantly buy it, once you know all about them. The gloves are built with padded synthetic leather, providing the care and comfort we are all looking for. To make things better, the palms and knuckles have extra padding and its textured fingertips provide additional protection for all kinds of situations and jobs. This is every handyman’s dream when it comes to hand safety gear. With all this padding and protection, its only natural to have concerns about its functionality as a working glove, especially about how fine or small of a task I would be able to perform with my fingers. Well, you don’t need to worry a single bit, because this product was engineered from scratch to provide you with all the comfort, protection, free of movement and fitting you need in a pair of work gloves. For the amount of protection they provide and their quality, we can easily say these are one of the best pairs of gloves out there in the market right now. This purchase is a 100% guilt- and repent-free, so don't think about it much longer, just click on the link and get yours now. There are some things about leather that you cannot beat with any other synthetic material, the comfortable yet durable feel of 100% cowhide on the skin is something hard to top. This is one of many reasons we ranked this product in our buying guide. Because despite the advancement of synthetics manufacturing processes, there are some of us that find comfort and protection in familiarity and traditionally crafted products. 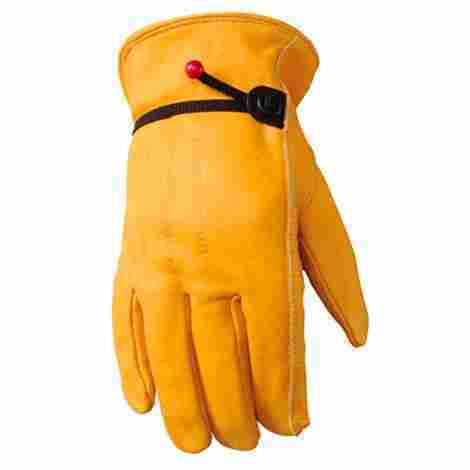 This timeless glove design its a classic in any work environment, including the mechanic shop. With its 100% grain cowhide, the feel on your hands it is not the only thing you will love about this pair. But this is not just a nice piece of garment, this pair of gloves will give you all the protection you need at the hardest of tasks. The leather is a much sought after material for protective wear in the industry because is both extremely tough but also incredibly flexible, and such are the main characteristics you want on your gloves. They provide excellent protection against cuts, punctures, and abrasion without hindering your dexterity. A good pair of leather work gloves have been around ever since we can remember, their continuous use in this day and age of technology tells us a lot about not only its commercial value but how much we like using them. We think Wells Lamont produces the best quality natural cowhide gloves out there in the market right now. Next, on our list, we feature this excellent product from the Ironclad company, which has been engineered to satisfy all the needs of the modern-day heavy duty worker. Built with a sweat wipe located on the back of the thumb that prevents irritation from sweat and the hook and loop closure near the wrists, they are comfortable, form-fitting mitts designed to handle all of your daily tasks. This original high-performance piece of garment features a patented palm design for superior dexterity and durability, synthetic leather reinforcements that provides extra strength in critical areas for long-lasting wear and a TPR cuff puller that allows you properly position your glove easier. Provided with patented flex-pattern padding, it goes beyond most of its competition when it comes to dexterity and durability, and for protection against extreme jobs, it has a rubberized knuckle impact absorber. For all the provided comfort and protection, this product has an amazingly low price tag. Built with the latest tech in synthetic high-performance materials, and with a fit and comfort hard to beat by any other brand, this product is surely able to satisfy your hand care needs at work. This is the product that launched this brand and line of gloves to global fame, and probably the most used work gloves in the professional mechanic and racing industries around the planet. Tested and proven for over 25 years, it delivers the perfect blend between dexterity and durability. The Original’s form-fitting Trek-Dry® will keep your hands cool and comfortable whilst performing any hard task, and its reinforced thumb and index give it extra strength and longer life. But that is not all, since its synthetic leather in touchscreen-capable for the perfect balance between durability and dexterity. 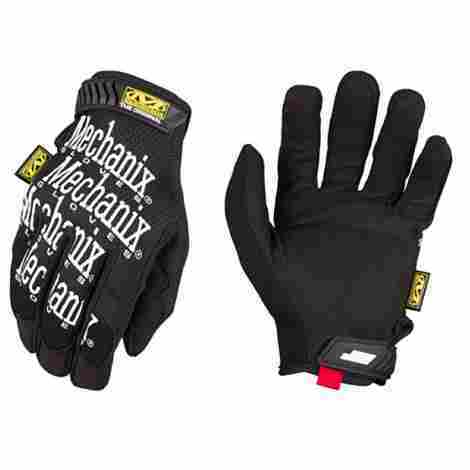 If you ever been to a professional racing track and wander around in the pit boxes, you would have probably noticed that almost every guy on all teams is wearing the same kind of gloves: Mechanix Wear The Original. It has been around for over a quarter of a century, and professionals are still loving it just as much as when it came out on the market for the first time. Giving its proven value as protective wear over the years, and tales from countless customer experience reviews, we know for a fact that this product goes well beyond its competition when it comes to quality, protection, comfort, and fit. So if you are looking for the most popular mechanic gloves in the world, you have just found it. Moving on in our list, we come down to number seven with another great bundle offer from the people of G&F. 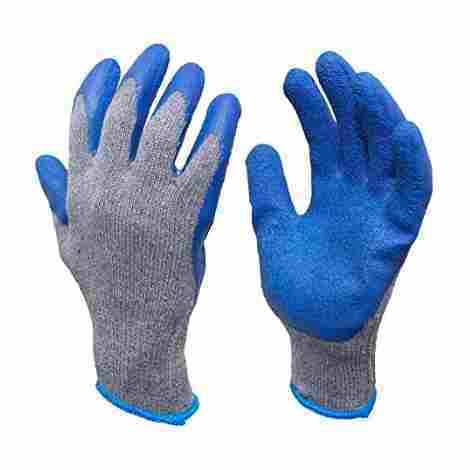 This 100% Cotton knitted work gloves are coated with textured blue latex for better grip and durability, covering whole palm and fingers. Great for any hard work not only in the shop but also performing excellently at construction, handling, and any other heavy-duty job. These cotton-knitted gloves will form and fit any shape and size of hands, and thanks to its seamless construction you get the maximum flexibility and dexterity for your fingers. Its breathable characteristics allow your hands to stay cool and after a few minutes of wearing them, odds are you will forget about them. The cotton in palm and fingers of these mitts is also coated with a breathable nitrile coating, resisting liquids and providing extra protection against cuts, punctures, and abrasions, keeping all undesirable residues from going into annoying places such as under your fingernails. We loved this product, not only for performing great in both professional and household environments and being machine-washable but also for its incredible price for a 12-pair deal. So if you are looking to stock your garage or shed with safety and quality gear, the G & F 3100 Work Gloves are the right choice for you. If you are looking toughness and durability, you need to look no further. These gloves from Ironclad are the brand's flagship, built to endure to most heavy abuse and easy to care and wash, extending the product’s lifetime well beyond any competition. Originally designed for ranch work, it obvious that they have taken their share of the mechanic and garage worker. 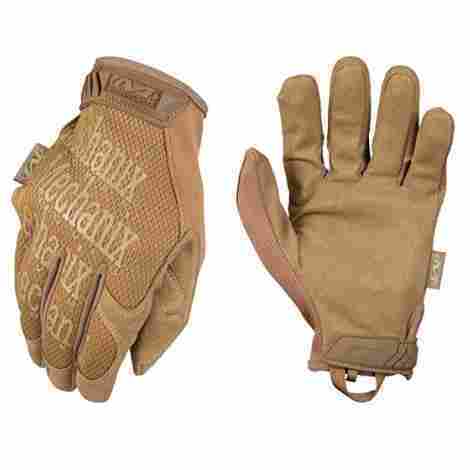 This engineered piece of garment is one of the toughest work gloves out there, built with a machine-washable 100% bullwhip leather and reinforced on critical areas between thumb and index with military grade kevlar fabric. Their unmatched durability and resistance to abuse have made them one of our favorite pairs out there right now. Not only this long-lasting pair of gloves are incredibly tough, but they also provide outstanding protection for your hands and fingers, starting with the patented Exo-Guard flexible finger protection, followed rolltop double layered fingertips, for extra dexterity and safety, and TPR knuckles protection, to keep your hands covered from every angle. 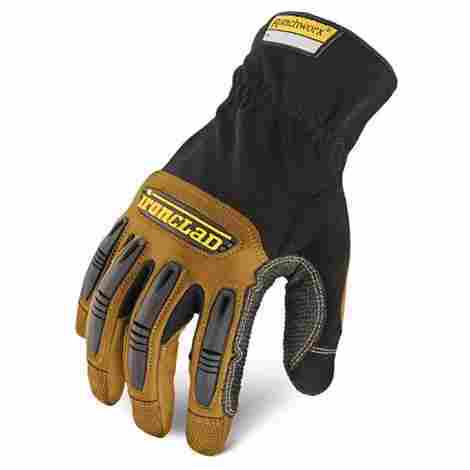 When compared with other products, the price tag on the Ironclad Ranchworx Work Gloves RWG2 is not cheap, but their quality and durability give them a prolonged life many-folds as long as the average competitor. We believe for its overall quality and protection, this product represents a solid investment in your safety. Down to number nine in our buying guide, we found this great product from one of our favorite manufacturers: Custom Leathercraft. This pair of gloves favor dexterity over armor, compared with other engineered gloves in our list. 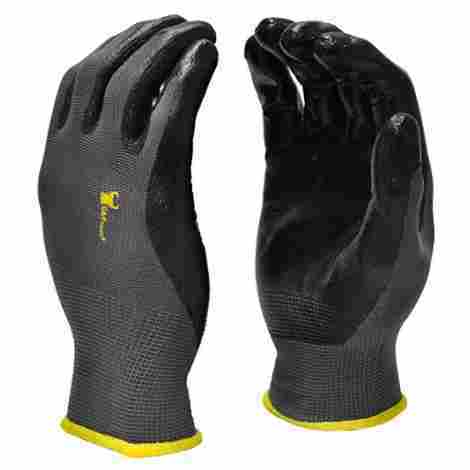 These gloves are ideal for the daily task around the garage that requires more freedom and functionality than protection and hardness. These pairs were designed for those little tasks around the shop that makes you want to take off most of your other gloves. The Workright are built with a patented Syntrex synthetic leather material which provides excellent grip and protection without hindering your finger dexterity. Complete with a breathable stretchy spandex back, it is guaranteed to fit your hands and digits best without affecting your range and reach. These multi-purpose gloves have been conceived and manufactured by one of the most respected companies in the safety gear industry. Their multiple patents and impressive market share hints away how much care and dedication they have put into all their products. Even the pattern on the palm’s padding has been designed to provide the best balance between dexterity, protection, and grip. We have chosen this product as our number nine in our list because it constitutes an excellent choice when it comes to light-weight jobs and dexterity needs. If you work on cars and dream of a pair of gloves that will protect your hands whilst allowing you to reach everywhere and perform the smallest of tasks, such a screwing a tiny screw, without the need to take your big and clumsy traditional work gloves, this is the ideal product for you. The last place in our list is reserved for this great deal from the Vgo, a 15-pair bundle offer, and will satisfy your safety needs not only around your garage but an many other tasks in professional and home environments. With great quality, fit and performance, deals like this are hard to ignore, especially if you are going through a lot of pairs on a weekly basis. The seamless polyester liner built gives your hand great fit and comfort, whilst its polyurethane coating gives your palms and fingers all the protection they need on the day-to-day of a mechanic shop. The knitted elastic wrists will make sure the gloves stay in their place, so you can focus on the task at hand. This 15-pair pack is ideal for your business monthly planning, where OSHA and other safety needs are requiring that employees and technicians use protective wear at all times. With excellent quality and durability for its class, it’s no surprise that this all-black pair of gloves are dispensed next to workers check-in clocks at many garages across the USA. We loved this product, not only for performing great in both professional and household environments and being machine-washable but also for its incredible price for a 12-pair deal. 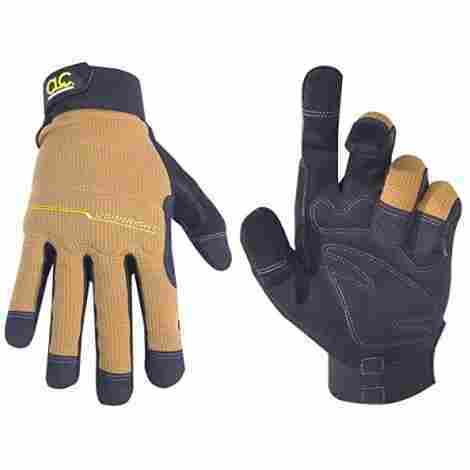 So if you are looking to stock your garage or shed with safety and quality gear, this work gloves are the right choice for you. Protective gloves are probably one the most design-challenging piece of garment since they need to meet so many different requirements: fitting, grip, elasticity, dexterity, strength, padding, water-/puncture-/cut- proofing, electrical insulation, and now most recently, they even need to have touchscreen digit tips to allow us to use our smartphones whilst wearing them. And as you can imagine there are hundreds if not thousands of choices in the market these days, some of them really good ones, but to be completely honest, most of them do not meet the minimum requirement of quality and safety rate, and represent more of a waste of money than an investment on your protection. First and foremost, these are safety gear, hence our first screening during the research phase was about the best protective wear for your hands and digits, regardless of the class or tier of product you are looking for. Heavy-duty working environments such as mechanic shops or garages pose a potential risk for anyone, especially if you are involved full time, so a good pair isa necessity, to ensure the health and security of our hands, avoiding hurtful bumps, caring for our skin, and keeping foreign and hazardous materials away from them. Therefore, no matter which product you pick from our list, you can rest assured that your precious and hard-working hands will be properly protected from now on. One of the biggest challenges when designing and crafting a good pair is providing good protection without hindering your ability to manipulate and operate the tiniest of objects involved in the daily tasks of the job, such as picking up nuts and bolts from the ground or tray, aligning a screw into position, or even reach to the back corners of the engine block under the hood of the vehicle. Our hands by designed by nature to provide us with the necessary grip to firmly but delicately handle all kind of objects, with different degrees of strength, and perform nearly any type of task we can come up with. Hence the options we use on ourselves must provide at least the same amount of grip as our hands to be considered a work glove, but we have not picked for our list any product that does not offer superior grip when compared to others in the same class. All the products found in this buying guide have been chosen for their ability to provide an excellent grip well beyond our bare-hand capability and allow your hands and fingers to move as naturally and freely as nature intended. When we wear our gloves for a whole working day, we need them to be as fitted and comfortable as possible, even after enduring hours of abuse and getting soaked in sweat or any other liquids, it is paramount that they stay on position firmly, in order to allow us to continue performing our tasks, with the risk of false grips, snaggling or falling out of our hands. In today’s day and age, these have evolved from just natural cowhide as lining to a diverse array of space-tech materials used in its crafting and layering, in order to provide the best and most comfortable fit whilst providing all other requirements such as grip and toughness. We have featured in this buying guide the only the best of the best when it comes to fit and comfort, in the hopes that you will forget that you are wearing the gloves and focus entirely at the task at hand. Is not just about covering the basics, in today’s world, we need more than that to be satisfied. We have this innate creativity and vision to project into our crafts and objects all sorts of goodies and features that will not only help you cover your most basic needs, but also make the rest of your life easier. The whole market of professional work gloves is constantly innovating and competing to offer the best features on their products, and the industry has come up with some amazing things such as touchscreen-capable gloves, so you can still use your smartphone or other work-related screens, or the back-thumb sweat pads, so you can properly wipe up the sweat off your skin without risking rashes. Work gloves are meant to be abused as much as a regular working shoe, and everyone knows that money invested in good shoes is money well invested. Therefore we have hand-picked for you only the best of the best available in the market right now, in terms of quality of the materials and craftsmanship, so your choice of gloves will last you the longest possible within its tier. Quality leads to durability and endurance, but it is not the only factor at play here. Imagine a glove that could last you a life’s time, but you could not wash properly, it would not be long before you decide to get a new pair just because of its smell. That’s why we can’t just look at one approach or feature, but evaluate the products as a whole, in order to get the big picture and make the wisest purchase possible for our specific situation and requirements. In this buying guide, we featured only the products that we consider offer the best in terms of quality and durability, to help you decide which pair of mechanic gloves suits your needs best, knowing that you are always looking a the top shelf of the market. The market for work gloves is so diverse, cost and quality range from the absolute poor to the outrageously overpriced, so in order to help you navigate this sea of potentially deceiving monsters, we have cross-checked all the above-mentioned criteria and charted them versus their real value, not only as a number logged in your business expenses books but as a item that will become a part of you for many hours a day, providing you with the protection, functionality, and comfort you need. We have featured a wide range of prices and classes of gloves, in order to help you find your match, regardless if you are a full-time professional or an occasional DIY mechanic. So rest assured whatever your pick is, you will get the absolute best bang for your buck. Q: Are all mechanic gloves machine-washable? A: No. We always recommend reading the manufactures information on labels and packages. Natural leather is one of the materials you want to be extra careful because it does not take water well unless treated properly. Q: How do I know the size of my fit? A: As a standard for both women and men, gloves size is measured longwise around the palm of your hand, excluding your thumb. In men, size S corresponds to measurements 7.5” and below, size M between 8 and 8.5 inches, and size L for 9” and over. Q: Why are modern work gloves made out of so many different materials? A: Before the synthetics era, leather was the protective natural material by choice, because of its amazing flexibility and durability, but it had so minor setbacks, including not being water-proof. With the advent of new synthetic materials, new composite liners where developed, and so the micro-specialization of the components of the glove pattern. So today we typically find gloves with synthetic leather on palm and fingers for grip and protection, spandex or lycra on cuffs and wrist for fitting and securing the gloves in position, and maybe cotton or nylon on the back for breathability of your skin, preventing sweaty hands whilst forming with every movement of your extremities. Q: Can I use my smartphone whilst wearing my work gloves? A: Touchscreen-capable fabrics are relatively new, and not all brands and use them on their products. They are still considered a specialty feature in the work glove industry, so be sure to inquire with the retailer and read all the product specifications before making any decisions. Q: How do I care best for my gloves? A: To help the life of your work gloves, step one is to get acquainted with the care instructions usually on the in-sown label or package, they will tell you the best way to wash and dry them. On top of this, some good advice would be to shake and dust your gloves after the end of your workday, make sure fingers are other parts are not kinked and hang them to air dry overnight. When handling corrosive of hazardous materials, make sure you wash or wipe them off with the appropriate solvent. Q: When to chose leather gloves? A: Leather is not a good friend of water, except when it is specially treated. So the general rule is that leather gloves are for generally “dry” jobs where not much water will be able to seep in the fabrics. The leather is excellent protection against abrasion, cuts, and punctures, so is perfect for metalworks, and welding gloves and gear is usually made of the same material. There are specific solvents to help you “clean” or remove from your hide gloves unwanted liquids such as oils or gasoline, but leather should not be washed in the traditional way with water and soap/solvent.